Whether you're looking for comfort camping or canoe-in camp sites where you might endup being bear food, Algonquin is the place to be. And given the huge size it's no wonder it is the most popular provincial park in Ontario. I personally found nothing particularly special asbout Algonquin - that you wouldn't find in most other parks - except the beautiful Barron Canyon. 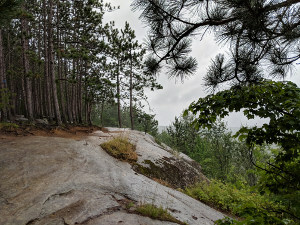 Barron Canyon is in North Algonquin (near Achray) and while it is an extra 200km drive (including ~40km of unpaved roads) to get there from the campsites on highway 60's corridor, it is without a doubt worth the drive if you like to experience the wilderness. If you like fishing or canoeing, specially long canoe trips, you'll love Algonquin. Otherwise for summer camping South Algonquin was just typical to me. There are some nice trails but overall Algonquin is a typical example of Ontario parks. Of course if you're up for a colder fall camping then you've got to visit Algonquin then for amazing fall colours. 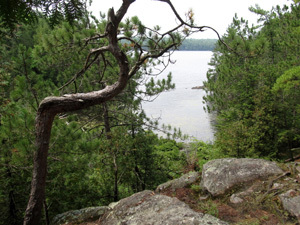 Site features: Camp sites on North Algonquin are the most beautiful, but they lack showers. In South Algonquin, I've heard Canisbay is the best, but haven't been there myself. We stayed at Kearney lake and it was beautiful. The privacy was great too. Kearney lake was beautiful but no good for swimming. Arrowhead is a miniature Algonquin (and is in fact connected to Algonquin through a river). The beach isn't great, but there are great trails for hiking and canoe. The view is great, so is the wildlife. I even befriended a moose here. Site features: Many sites, most of them with great privacy and quality. Electricity (some), showers, flush toiletes (a bit far for some camp sites), radio-free zone. Wildlife: Deer, moose, fox, raccoon's, skunks, chipmunks, beaver, lots of birds and even a wandering bear. I only got to visit Awenda for a day visit to access the beaches. The beache that we used was rocky at some places but there were sandy areas as well. You can jump off some of the bigger rocks and the view is pretty nice. Outside the beach there was plenty of room and we managed to find a good spot to eat and relax (although there are other picnic areas as well). Site features: There are sites with good privacy and hydro sites according the the site (we didn't get to experience the sites yet). Wildlife: White-tailed deer, birds, porcupine, raccoon and squirrels. Balsam lake is a calm and clean lake about 150 kilometers north-east of Toronto. For me it is very similar to Sibbald point except it is relatively far but has a better lake for both swimming and canoeing. Balsam lake has islands that you can get to by a boat (they're not part of the park). The trails are dry in some areas but pretty nice. The camp sites don't have the best privacy but they're OK.
Wildlife: Deer, Fox, Raccoons, Flying squirrels, beaver, birds and apparently ONE bear! Bon Echo can give you one of the best natural experiences you can get in southern Ontario. 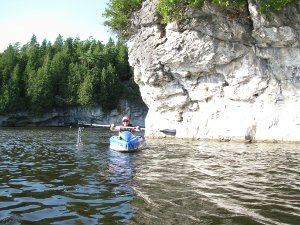 You can go for a 23-kilometer canoe trip which includes over 1.5 kilmeters of portage (make sure to go in the direction where you do the portage first) or go for a 17-kilometer hike. You can boat the beautiful Mazinaw lake, or stay in your camp site and enjoy the amazing natural setting of Hardwood Hills camground. You can get a ride on a tour boat and visit the native pictograms, or enjoy the sandy beaches. 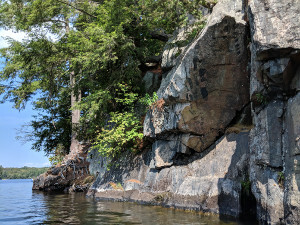 Bon Echo doesn't have the best water for swimming, and you might even get the swimmer's itch, but jumping off a clif into the dark waters of one of the deepest lakes in Ontario could be an interesting experience. Site features: Mazinaw Lake: Full-service, next to beaches & other recreational facilities. 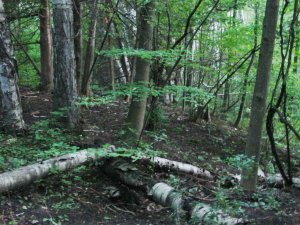 Hardwood Hill: Semi-wilderness, walk-in sites with a unique natural experience. If you're up for a four-hour drive and at least a two-night stay - which is absolutely worth it - then try Bruce Peninsula, the most magnificent piece of nature I've yet seen in Canada (I haven't been to the west coast yet). Walk a beautiful 3-kilometre trail to the beautiful rocky coasts and the deep blue Georgian Bay (this is right between Georgian Bay and Lake Huron), then either jump of a cost (you're not supposed to - but won't resist it!) or check out the beautiful Grotto. If you're not up for the walk, Cyprus lake is near the campsites and the warm water is perfect for swimming and canoing (but watch out for the snakes). Unlike most provincial parks there aren't any showers there - but can use pay showers just outside the park. Also with bears and other wild animals I wouldn't recommend it to first-time campers going alone. Very small park, probably the smallest I've seen. Camp sites are relatively small and close to one another. The Georgian Bay shore is beautiful and the water is clear. It's rocky and no sandy beaches in the park. You may find some fossils in the shoreline. Other than that not much in the park, however the park is very close to Bluemountain Village where you can find lots of activities. Also there are trails outside the park. Located on the 401 less than 50 km east of Toronto, Darlington is the closest camp site to Toronto that I've been to. There is a rail track passing near the park that makes it impossible to sleep, the toilette aren't great for some camp sites and most sites don't have a good privacy but it's great for first time campers because it's so close you can just drive home and sleep if you running into equipment problem! 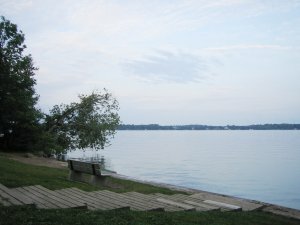 The park is located between a shallow McLaughlin Bay and lake Ontario which makes it perfect for both swimming and canoing. There are some nice butterflies, hawks and rabbits and if you go there in the fall (which I didn't) you can see the white-tailed deer. Located just over 100 kilometres west of Toronto, Elora Gorge is one of the most beautiful parks I've been to. Some of the camp sites are at the edge of the Gorge where you have to park your car & walk into the steep but beatufil & private campsite. The main attraction of the park is tubing the Gorge. The water was pretty dirty when I was there, but still worth the experience. The park is in beautiful town of Elora, ON which is a must be town on it's own. Activities: Tubing, Hiking, Swimming (wouldn't recomment it though), Fishing and Cycling. Their website mentions canoing as well, but we couldn't find a place to canoe in or around the park. 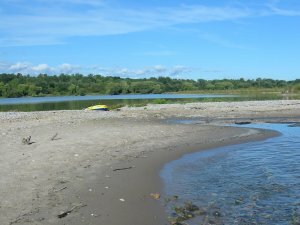 Located near Peterborough, ON Emily has good campsites and if you like wildlife viewing you can see the Osprey fly above the river or see their active nests in the only trail in the park. 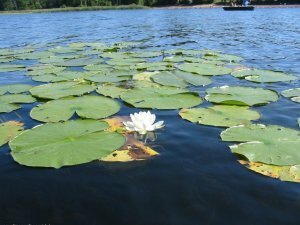 The river is not so good for swimming but it's shallow and calm and those beautiful water lilies make it the perfect place to paddle and fish. 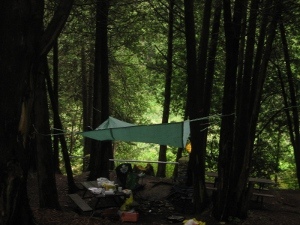 There are very large campsites with pretty good privacy in the park, however, if you just want to go camping there are similar places closer to Toronto. Site features: Showers, some close to body of water, private, laundry. Killbear is huge. About 1500 campsites and it's one of the most beautiful parks I've been to. You can walk the beautiful rocky trails and enjoy the wildlife. I saw deers and snakes a number of times, and was accompanied by chipmunks pretty much the whole time. I even got to chase and film a snake in the water. And - as the name suggests - there are bears too, but I only got to see the droppings! 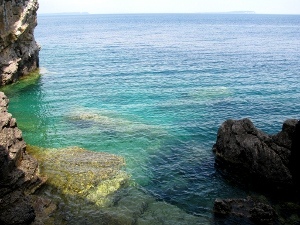 You can enjoy some amazing sandy beaches or experience the thrill of jumping from up to 3-meter-high cliffs into pitch black water with snakes! There is something to do for everyone. The park includes different campgroups, some with their own registration office and the facilities are great. 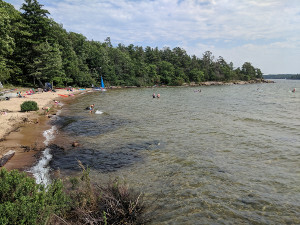 The park has beaches on the lake Huron shore. If you're up for it Sauble Beach is just a short drive away. There are a few trails from less than a kilometer to 6 kilometers and they're pretty nice. Site features: All campground have comfort stations with flush toilettes, showers and laundry. 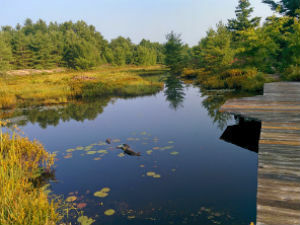 Oastler Lake is a small park close to Parry Sound. There's only a lake that is OK for a small canoe trip and no trails. The best feature of the park is that many camp sites have direct water access. But except for the more back country sites, the sites are very close with little privacy. Another terrible feature of the park is the noise from the train at night. If you can live with the noise the park is a good camp to visit the places nearby. 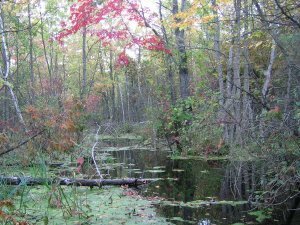 Rockwood conservation area (part of the grand river conservation authority) is located near Guelph & is very easy to get to. It features a relatively large but shallow river with a beautiful rockey scene that is perfect for canoing. When I visited, the water was pretty dirty & not suitable for swimming. There are also some nice trails with potholes & small caves. 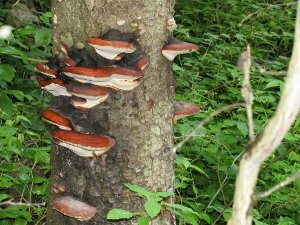 Overall the park has nice ecological features. The park is not managed as good as the provincial or national parks, however considering the distance & beautiful scenery it's a great last minute destination for canoeing whether you decide to stay for the night or not. The sites were close together but our site was surrounded by a beautiful rocky scene & as far as I'm concerned in the mountain-less east coast, rocks rock! The park itself doesn't have much besides the river and the falls. The water wasn't vert clean but jumping in the falls was a fun experience. The location of the park is great though. 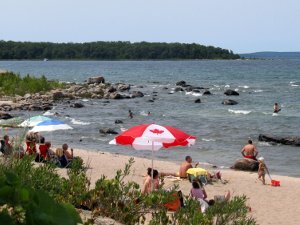 It's less than 3 kilometers from Sauble Beach - a town with over 2 kilometers of super-busy but nice and sandy beaches. 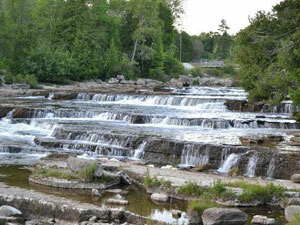 It's also located in south Bruce peninsula and is a great stop-over for a day-trip to the peninsula. The camp sites are just OK but some of them are connected to the river and great for taking a canoe. You can also rent canoes. Wildlife: Not much inside the park. A red pine plantation beside the park shelters white-tailed deer, fox, and other animals. If you're looking for a nice place to swim, as the name suggests, Sandbanks has a wonderful sandy beach. It also has a river that's a nice place to canoe, but it's just average. Considering the distance from Toronto though, Sandbanks is not on my list of favorite camp sites. If I am to drive for 200 kilometers I would prefer to go to Bruce peninsula or Algonquin. Sandbanks also lacks flush toilettes & showers in some campsites. The other problem was that I had to drive for about 10 kilometers to reach certain parts of the park. Last but not least, in some campgrounds you'd have to looks at trailers & satellite dishes instead of trees & some other parts of the parks looked more like a residential area than a provincial park. 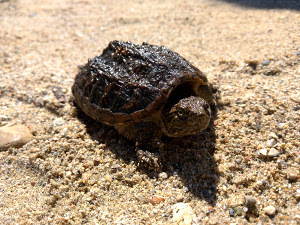 Wildlife:Birds, small mamals & reptiles. 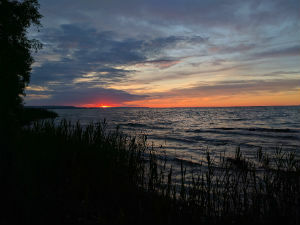 Located on the southern coast of lake Simcoe in York Region, close to Toronto, Sibbald Point is my favourite camping place. With lots of tall green trees providing a nice and private campsite, sandy beaches and nightly police patrol it's the perfect place to setup your tent and have a wonderful night in nature, just watch out for raccoon attacks! In many ways Silent Lake is similar to Bon Echo. You won't get to experience the natural wilderness of the campgrounds in Bon Echo but it is better for swimming. There was docks in the beach. The trail is good but relatively tough and uneven. 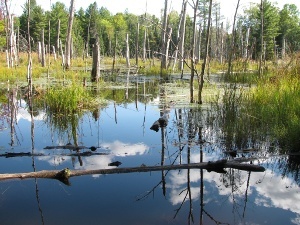 We got to see beaver dams while hiking. The park is relatively quieter than most Ontario parks. Perhaps because there are better parks closer to Toronto and Ottawa. It was a good place to spot the deer as we saw a few deer every morning. Site features: Full-service, showers and laundry. Relatively good privacy. The park includes a few great walk-in sites as well. Wildlife: Deer, Otters, minks and beavers. 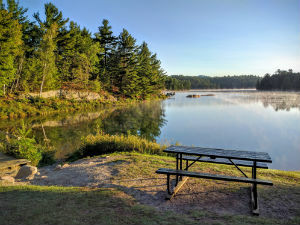 I reserved Six Mile Lake because it was one of the few parks near Toronto with camp sites available for reservation at the time. The trails were short & rocky - relatively nice and hard with lots of mosquitos and flies. The lake was dirty and the seaweed didn't make it suitable for swimming past the kids area. Shells in the water were sharp and managed to cut someone's food. The Canoing was fun and rentals were available. We even managed to see a beaver swim around the canoe. The biggest problem with the park was the lack of flush toilettes. They only had two toilettes in the general use area. Some outcasts had a sync and were not too bad, however. The park is close, but unless you get one of the camp sites further away, the noise from the highway might bother you at night. 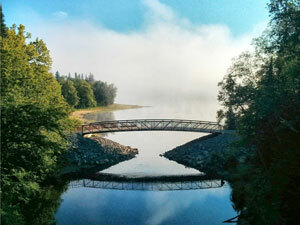 Site features: There are sites with great privacy, sites with access to the lake and hydro sites. Laundy, showers and only two flush toilettes. Wildlife: Not listed. We saw chipmunks, a hawk and a beaver. Located near the African Lion Safari in Hamilton, Valens is a relatively good destination for near-Toronto camping. We visited the park in early fall and the trails looked great, however the lake was pretty dry and the beach was way too dirty for swimming. It's definitly worth the effort to leave your car and use their more natural camp sites (there is no direct car access to them, but their close to the parking). The park is open 11 months a year and you get access cards so you can easily leave the park any time. Site features: quiet nature sites, washrooms, shower, laundry, playground, complete alcohol ban.